Robert was born July 27, 1989 and was an amazing person! He was from Harrison, Michigan where he graduated from Harrison High School in 2007. He chose to serve our country by joining the US ARMY. Robert gave the ultimate sacrifice while serving in Iraq on April 29, 2011. This will be an official timed 3 mile run or walk in honor of SPC. Robert Friese. The date of this event coincides with the date of Robert’s ultimate sacrifice to this great nation! The Veterans Freedom Park Freedom 5k Run/Walk is hosted in memory of Spc. 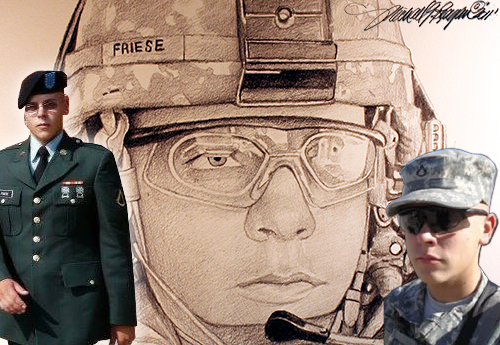 Robert Friese and all those who have given the ultimate sacrifice in defense of the freedom of others. On behalf of the Veterans Freedom Park Committee, we would like to invite you to join us at our 8th Annual Freedom/Friese 5k run/walk in memory of Spc. Robert Friese on April 27, 2017; as this date coincides with Roberts ultimate sacrifice to this great nation. We have made some enhancements to our event this year, and your participation and support is needed to continue to maintain and add features to this park. We are hoping that you will have the opportunity to show your support, by becoming a sponsor and participating at this great event. For your convenience you can now register and pay online here! Now is the time to register! All Proceeds go towards Veterans Freedom Park’s maintenance and improvements. ‘Veterans Freedom Park’ of Clare County is located across from the courthouse on the corner lot of Broad/Main Street. It is our motto and goal to make this a place to ‘Remember, Honor and Reflect’ on the great sacrifice that our past and current service men and woman have made. If you would like more information or are unable to attend but would like to donate. Corner of N Broad St & M-61 Across From Ct House. LATE registration will be available on Friday April 26th, 4:00pm to 8:00pm and on Saturday April 27th 8:30am-9:30am, both registrations will be held Indoors, in the Harrison Community School Building, adjacent to the race site. PLEASE NOTE* you’re not guarenteed to get a T-shirt if you register late. Awards will be given to top Male/Female overall finishers. Top Master Group (over 50) and for each age group. Awards Presentation will be held at the registration area at 11:30am. No awards will be given for the 3 mile walk. Walkers will not be officially timed, however self-timing equipment will be available on Race Day. $25.00 per Registrant until April 19th, 2019/ T-shirt included After April 19th the fee is $30.00 per Registrant with no guaranteed T-shirt. Your registration must be postmarked by April 14th, 2017 to be guaranteed a T-shirt. You are Eligible to enter the Mackinaw Bridge Labor Day Run Lottery! Provides premier line of identification tags. Track this race through the RaceJoy PhoneTrak app!